Mariell's top-selling Black Diamond Austrian crystal stretch bracelet with glittering round-cut gems is the perfect high-fashion jewelry for bridesmaids, proms, homecoming, prom, mother of the bride or special occasions. 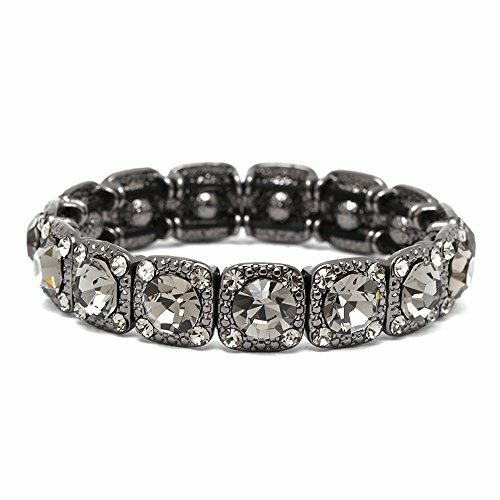 This glamorous adjustable size 7" bracelet by Mariell is plated in Gun Metal color Hematite with deep grey crystals. At 1/2 inch wide, this crystal stretch bangle is just the right size to add endless sparkle in a lightweight comfortable silhouette. We love the "dress up" or "dress down" versatility of this popular vintage-inspired bangle. After your special occasion frocks are neatly tucked back in the closet, wear this adjustable fashion bracelet with your business wardrobe or with jeans and a sweater for a delightful splash of bling. This best-selling gray crystal stretch bracelet is the perfect addition to every jewelry collection! With its adjustable size and great low price, its perfect for gift-giving! We promise you'll adore this dazzling stretch bracelet or your Money-Back. Treat yourself or someone you love to some seriously gorgeous sparkle. Enjoy Mariell's exclusive 100% Risk-Free Purchase and Lifetime Guarantee.